This is Day 4 of the chicken pox saga. Miss Z is lucky she doesn't have that many spots. She does have a few more on her body though. But what she gets instead of spots is glands the size or large marbles up the back of her neck and behind her ears, making moving her head hurt. plus laying down puts pressure on the glands and then that hurts. This is also day 4 for Master J. 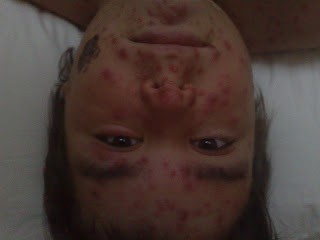 He has copped a lot more pox than his sister. Below is a face shot but some how I have managed to get it upside down. He has them every where that you could think of and probable more.In the ears, inside of the eye lids, bottom of the feet, in between fingers and toes and other very unpleasant places. Found out after I bought Calamine Lotion that its not used for chicken pox any more, they think it makes them scare. So no I have burn cream and Solosite which is a healing cream for burns, chicken pox and cuts. 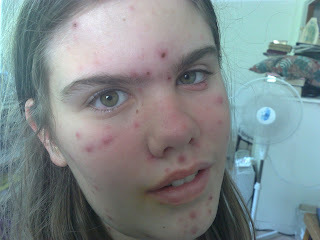 Oh, that is the worst I've seen chicken pox! The poor things. Sorry for the bum steer on the Calamine lotion! Should check my facts first. Oh your poor DC, and in this horrid heat as well- euck. My 2 have not had it yet, but DH and I got it when we were travelling around Aus and living in a bus without a shower, it was in a heatwave as well. Wishing them better really soon.